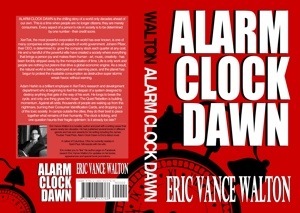 Alarm Clock Dawn, author Eric Vance Walton’s debut novel, is the chilling story of a world only decades ahead of our own. Adam Harkin is an employee of XenTek, the most powerful corporation the world has ever known. Adam begins to question the purpose of his existence in a world where people are no longer citizens; they are merely consumers. Every aspect of a person’s role in society is to be determined by one number-their credit score. The planet is protesting corporate greed and insatiable consumerism through crippling super storms that erupt without warning. In a race against time, thousands of people are waking up from this nightmare, burning their Consumer Identification Cards and doing the only thing they can to strike back-dropping out of this toxic society. One by one they are joining the Quiet Rebellion and moving to the camps outside the cities. The fate of humanity itself is at stake and the clock is ticking. One question haunts their fragile optimism: Is it already too late? Alarm Clock Dawn is a book that draws you in immediately, takes you on a wild adventure, and in the end leaves you a slightly different person. Join the Quiet Rebellion now! Buy Alarm Clock Dawn in paperback and eBook formats!